Often when searching for net-net's in the US one name keeps reappearing in the lists, that's Audiovox. Audiovox has been mentioned a number of times by Jonathan Heller at Cheap Stocks, and in an interview he did with Geoff Gannon for the Investors Question podcast Jonathan proclaimed that Audiovox might be a permanent net-net. This isn't the most reassuring thing to hear as an investor in Audiovox, I've held them for about a year now and with their annual report recently released I thought I'd revisit them again. To give a little background on Audiovox back in 2005 they were a cell phone manufacturer with $1.8b in sales yearly. They sold off their cell phone division and decided to reinvent themselves in the accessory business. Since moving into accessories margins and revenue have climbed steadily. In addition to Audiovox being a net-net they are a rare beast in that they are a profitable as well. 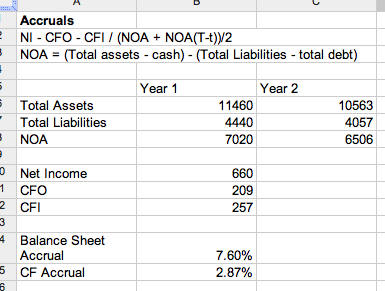 When examining most net-net's I will evaluate the balance sheet, and bolt on earnings power. 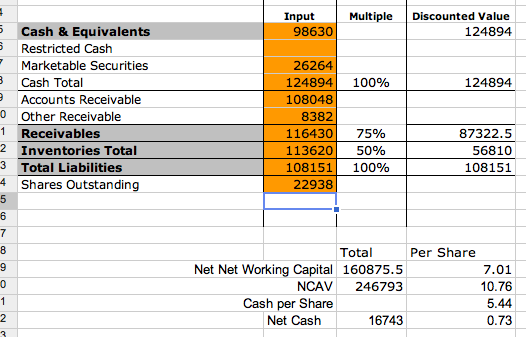 I don't think that sort of valuation applies in Audiovox's case, so I'm going to take a look at the balance sheet, then their earning power separately. The first thing that stands out is that the company's balance sheet is made up mostly of inventory and receivables. 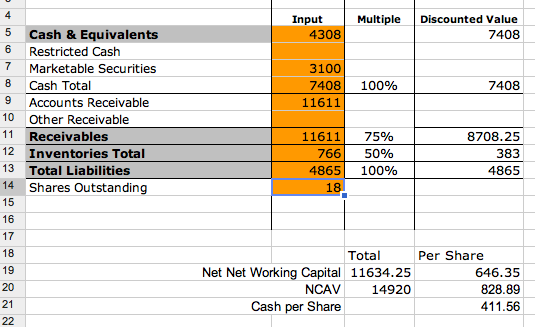 While receivables and inventory are a large percentage of ncav they've remained fairly steady for the past five years, and carrying large balances isn't uncommon in the industry. On an asset basis Audiovox is trading about 30% ncav and about 10% above discounted net working capital. This is a nice discount but nothing to write home about. On an asset basis Audiovox isn't the most compelling net-net I've ever seen. I think the earnings aspect of Audiovox is the most compelling aspect of this investment, and it seems the earnings picture is getting a bit stronger. In fiscal year 2010 the company earned $1 per share, and is trading at a P/E of 7.7. The company also had CFO of $1.40 per share which puts them at a P/CF of 5.5. Both of these are low metrics especially given that the company is on the mend with regards to earnings. While sales grew 2% from 2010 to 2011 cash from operations grew 35% and capex shrunk 40%. 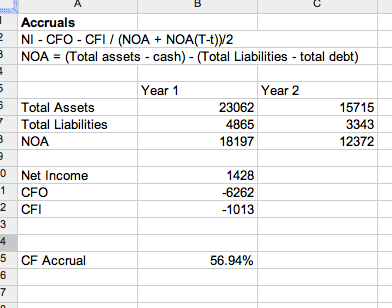 Free cash flow defined as CFO minus capex is $1.26 a share. While I usually don't put much weight on management forecasts because no one can know the future the forecast for Audiovox is intriguing. They acquired Klipsch a car audio manufacturer at the beginning of March for cash and some debt. Management has stated that Klipsch will be accretive to earnings immediately and help boost revenue by 29%. 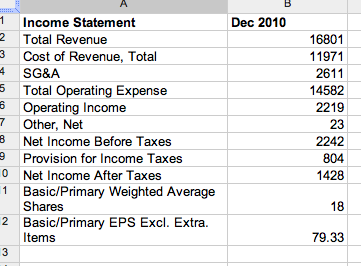 Management also expects EBITDA to be $42m up from $10.7m in 2010. So what do we have, a company trading at a slight discount to ncav and an improving earnings picture. All seems great right, well there are always risks involved. -The company has been trading at a discount to ncav for the past few years, the market hasn't recognized it's value then, it might never recognize intrinsic value. -The acquisition of Klipsch could destroy shareholder value and leave the company saddled with debt. -Audiovox has a long history of rolling out products like FLO TV that fail in the marketplace, maybe the discount to ncav is warranted with the lack of product execution. -It might be hard to realize the full ncav in a liquidation, inventory could be junk, and receivables might pay up at a discount. 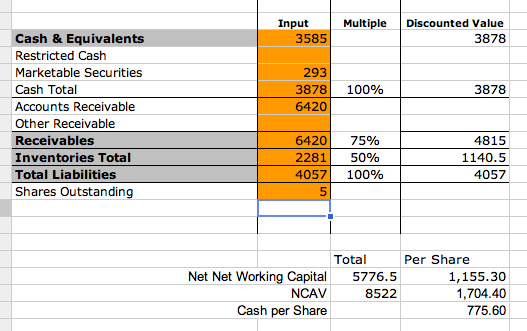 I'm not really sure how to fully value Audiovox, I am taking a 50% discount to ncav or basically cash value and then applying an earnings multiple, here are a few scenarios. I'm not sure if any of these values will be realized, but I'd be happy with even the worst case. As with all investments time will tell. SPK Corp is an aftermarket auto parts wholesaler and distributor. The company is located in Osaka Japan which is south of Tokyo and unaffected by the earthquake. The company did have a sales office in Sendai, the status of that office is unknown. The company either manufactures or sources parts such as clutches, transmission assemblies, gaskets, electronics among other items. SPK also sells aftermarket heavy machinery parts for agriculture and construction equipment. Overall this is a very boring business, a nice thing about boring businesses is they are easy to understand. SPK also has a very nice English website that has a nice product catalog, and links to sites where you can actually buy the products. The procurement sites are all in Japanese, so if you wanted to buy a gasket and examine the quality you will need to use a translator or read Japanese. -Sales increased YoY from 2009, the company hasn't experienced a loss in the last five years through the midst of the recession. -The earnings quality is pretty good, balance sheet accruals at 7% and cash flow accruals at 2.8%, both good measures. -Cash taxes paid on EBT comes out to a 36% effective tax rate which is in line with Japanese taxes. -Cash from operations has been positive for the last five years as well. During the same time period cash balances increased in all years except for one. -Cash and book value have been steadily growing. -Dividend yield of 4.2% for 2012 paid in two installments, mid year and end of the year. 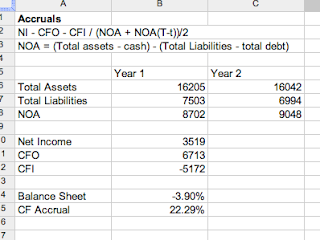 Historic statements can be found on FT.com the numbers for SPK are accurate, FT.com will give a five year view, because of this I didn't enter the historical income statements into my own spreadsheet, why duplicate the work. Get the statements here. To figure out what a good value is I'll examine a few scenarios. The stock is trading below NCAV, very close to discounted net working capital, cash is 62% of share price. If the company rises to it's net current asset value it would be a 36% increase in share price. Another measure to consider is that if the shares trade up to book value it would be a 60% increase in share price. I think there is more value than just rising to NCAV or to book value, the company is profitable and cash flow positive. 10x ¥124 = ¥1240 + ¥775 = ¥2015 per share a 61% increase from the current price. 10x ¥141 = ¥1410 + ¥775 = ¥2185 a 75% increase from the current price. If the market never recognizes the value of the assets and earnings grow to their 2007 level and the multiple stays the same it would be a 25% increase in share price from here. -Tied to the auto industry which is at a practical standstill after the earthquake, Japanese car factories are idled or operating at low capacity. -The company is a small cap stock, with a market cap of approx $100m. -Due to being a small cap stock it's also pretty illiquid, with an average of 4k shares trading a day. The block size for SPK is 100 shares or about $1600 per block. The shares do trade almost all days, I was able to get a fill for my shares somewhat quickly after I placed my order. -Building a $100k position at 25% of the daily volume would take about 7 trading days. -The company earns a low ROIC, low ROE, low ROA, and has a large balance of cash that slowly is expanding, it could trade at a discount to NCAV for a long time. Talk to Nate about SPK Corp or anything else on your mind. Dainichi is a Japanese company located in north western Japan, and was unaffected by the recent earthquake. The company manufactures oil heaters along with a few other minor business lines. The company introduced a vaporized oil heater in the early 70s and have expanded their product line using their original technology. They've since expanded to coffee roasters, and garbage processing machines. 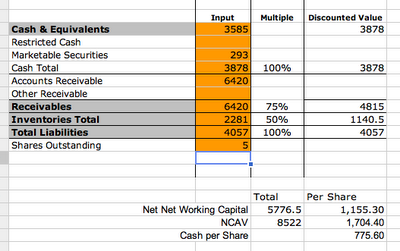 Dainichi is undeniably cheap, it's trading below NCAV and below discounted net working capital. Dainichi is very cheap on a balance sheet basis, but I'm not sure that the balance sheet tells the whole story. The danger with investing in a net-net is that even while the company is cheap the operating business is doing something to destroy the margin of safety. We can see that NCAV is ¥828 or 31% above the current price, while NWC is 2% above the current price, even the cash per share is 65% of the current market price. From a balance sheet perspective there is an undeniable margin of safety, the company is trading below liquidation value. 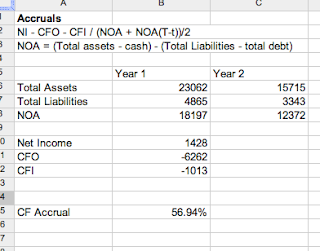 Having a fortress balance sheet is great but for a company to survive it needs to either be break even or turning a profit, to evaluate that we take a look at Dainichi's current income statement. From an income statement perspective the margin is safe, the company is profitable earning ¥79 per share. The company only lost money once in the last five years which is a pretty decent track record considering the economic shape of Japan. So far the margin looks intact, great balance sheet, and great income statement. I have always liked the expression "The income statement tells how the business is doing, the statement of cash flows tells if management is lying, and the balance sheet is a snapshot in time." 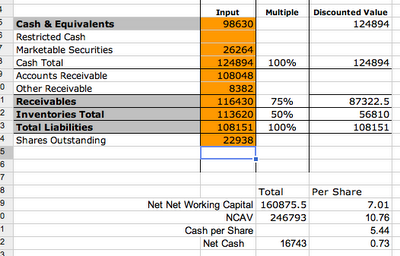 I feel the line about the cash flows tells the biggest story with Dainichi. So the company posted a profit, of ¥79 per share, but cash flow from operations was a negative ¥347 per share, what's going on? 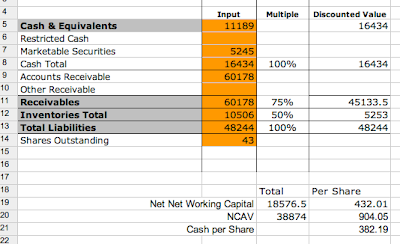 An amazing 56.94% of the earnings are accrued earnings without any cash flow. This is quite concerning, I'm not saying the company is a fraud, it's just that they have pretty aggressive revenue recognition policies. How else do we know this, well accounts receivable ballooned ¥9938bn in the latest period. So knowing that earnings quality isn't very strong let's look at the relevant cash flow items for the current period. The cash flow statement lies bare the fact that the margin is not safe. In the latest period the operating division burned through ¥6262bn. In addition the company also spent ¥1013bn on investments and ¥421 on dividends and share buybacks. It seems crazy to me that they're still paying a dividend and buying back stock, but as noted elsewhere, Japanese companies seem to work with different corporate interests. So what does this all mean? 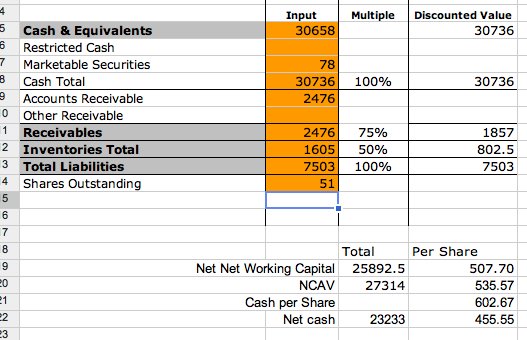 For me the big takeaway is that while the balance sheet looks great, and the income statement seems to strengthen the investment case of Dainichi the cash flows just aren't there to support the numbers. In addition there is a real concern that the cash outflows at the company could lead to either financing the operational cash flow gap, or insolvency. I didn't expect this post to turn out into a walk through on how I evaluate margins of safety in net-nets, I expected to just write up another Japanese stock that looked decent. But as I went through the story the statements told was so clear I couldn't help but write my post to show the destruction of safety. To just throw out the net-net figures and say it's profitable without delving into the reality is dangerous. Sometimes the market is very wrong about stocks, but other times the market is right. In Dainichi's case I think the market is correct to discount their share price, if the company keeps performing at the same level they might not exist in a few years. Talk to Nate about Dainichi Co Ltd, or Japanese net-net investing. Disclosure: I own none of the issues mentioned in this post.